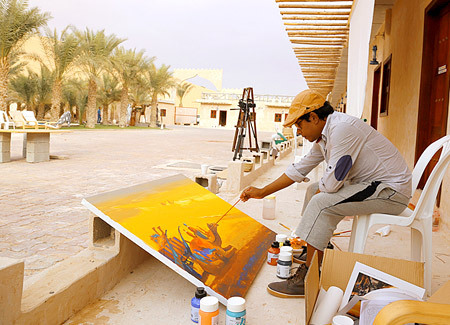 Ananta Mandal is an award winning internationally recognized contemporary Indian Artist. He is an expressive and imaginative painter. Mostly his paintings are created in impressionist manner and surrealist way in various mediums like watercolor, oil and acrylic. He lives and works in Mumbai, India. He has evolved a highly individual style, deeply contemporary in its sensibilities. His paintings are best known for realistic urban landscapes. His brush stroke speaks of many things: the hustle and bustle of modern city life, figurative movements, festive seasons, seascapes and lakes, the time endured old railway steam engine, tropical desert, and the many moods of nature; where fluid moments are brilliantly captured by the artist. He has also gained recognition for his surrealistic paintings. Ananta bagged many national and international awards. 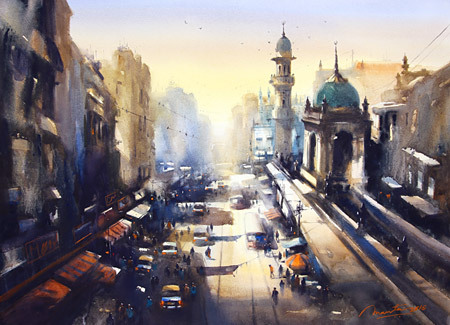 From participating in the most prestigious Harmony Art show, Mumbai in 2008, his excellent achievements include Award from Northwest Watercolor Society, Annual International Exhibition, Washington in 2017, the First Place Award from 36th International Exhibition at the Watercolor Art Society-Houston, U.S.A. in 2013, Award for Best Landscape in Watercolor from The Bombay Art Society, Mumbai, in both 2011 and 2006, and many more to mention. In 2016, Ananta was invited by the Indian branch of Faber Castell to test their new watercolors. His painting is featured in the front cover of their new set of watercolors. Ananta is a member of numerous art organizations, including Member of The Pennsylvania Watercolor Society 2012-13, San Diego Watercolor Society, U.S.A. - 2008-09, Philadelphia Water Color Society, U.S.A. - 2008-09. Life Member of the Bombay Art Society, the Art Society of India, Mumbai. Besides involving himself in Workshops, he also keeps himself busy in making experimental art films based on paintings, Video Installations. Among his various passions, Photography also has a place. His works can be viewed in numerous public and private collections worldwide. It's my pleasure to contribute my painting's image to be the part of Faber Castell new introduced watercolor front cover. I am being testing the colors from the primary stage and have shared my experience with the entire team involved. I felt the colors are very good intensity with transparency, purity and vibrancy. They easily dilutes giving great flow and the perfect blend of bright and dark shades. My painting Minara Masjid, Mumbai has been awarded into the Northwest Watercolor Society's 77th International Open Exhibition to be held April 25- June 2, 2017 at the Harbor History Museum, Gig Harbor, WA. Juror selected 60 paintings from around the world, among which one of mine has a place in this prestigious exhibition. This is indeed very exciting for me to join the event Art for a case organized jointly by TellusArt and Abu Dhabi Art Hub. I appreciate the fact that this event provides an international platform for artists to live, create art, meet and work with the many artists from different countries around the world. It has been an enriching experience for me and for my artwork as well. The first look of my 15th solo exhibition is revealed now. The show will be in Gallery Art & Soul very soon. More details are coming shortly..